It is even worse, in a way, than Ajami tells it. After the Shah had left, the U.S. pressured the Iranian army not to crack down on demonstrators. Facebook had no answer to the pro-regime vigilantes who ruled the streets. And the U.S. president, who might have helped, stood aside. Three decades ago, before his final flight to exile, the Shah of Iran had drawn a line: He would not fire on his people. He was a king, he said, and not a dictator. The army had not yet cracked; there were loyalists keen to make a stand against the revolutionary upheaval. But the man at the center of the storm had boarded a plane, with his immediate family, in search of a country that would have him. It's impossible to fathom such a principled retreat by today's "Supreme Leader," Ayatollah Ali Khamenei, and his vast apparatus of repression and terror. If anything, a year after the fraudulent election last June 12, the theocracy is entrenched and the Revolutionary Guards and the Basij, the regime's murderous paramilitaries, man a political order bereft of mercy and restraint. Iran was not fated to have its "velvet revolution." The Green movement that challenged the ruling apparatus has not been able to carry the day. Those expecting a quick deliverance for the people of Iran never fully took in the power of the regime and its instruments of repression. This wasn't Leipzig and Budapest and Warsaw and Berlin in 1989 when the Communist despotisms gave way; this was China after Tiananmen Square. In retrospect, it could be said that the first Islamic Republic (1979-2009) had fallen, and that a second republic, more cruel and unapologetic in its exercise of power, had risen. It wasn't pretty that first republic, but it had pretensions to a measure of pluralism and it gave some sustenance to those in Europe and in American liberal circles who believed that the Iranian revolution was making its way to an accommodation with the international order of states. In his seminal book "The Anatomy of Revolution," historian Crane Brinton had sketched the progression of revolutions: their outbreak and early euphoria, the destruction of the moderates, and the triumph of the extremists as revolutions devour their own children. In the final phase, there is Thermidor—borrowed from the calendar of the French Revolution—where there is a slow return to less heroic times, and a period of convalescence. Iran was to defy that revolutionary calendar, and it now appears to have entered an apocalyptic phase; a darker night of despotism has settled upon the weary people of Iran. A schism has opened in Iranian society: Ayatollah Ruhollah Khomeini's terrible children have turned on his garden-variety radical children. We can now see the hubris of cyber optimism, the naiveté of thinking that Twitter and Facebook and YouTube would topple a ruthless regime determined to maintain its grip on a restless nation. At the heart of it, this was and remains a brutal fight, a raw assertion of power. Facebook has no answer to the vigilantes of the Basij roaming the streets of Iran looking for prey. Twitter can't overcome the Revolutionary Guard with the wealth and resources granted them by a command economy they have managed to organize to their own preference. The truth of this Iranian state is straightforward: It is a petrocracy. Oil income sustains it, enables it to defy the opinions of its own people, and of people beyond. In the past year, Mahmoud Ahmadinejad and his allies in the bureaucracy and parliament have been pushing for a "streamlining" of the country's extensive system of subsidies—in effect for a phasing out of price subsidies for bread, electricity, water and gasoline. The system in place is inefficient and costly (it takes an estimated 40% of the budget to sustain the subsidies). But it isn't a true desire for reform or economic progress that motivates President Ahmadinejad. What he and his supporters seek is a targeted system of rebates and cash transfers that would give the rulers yet greater powers to reward and to punish. This is the sword of Damocles over the opposition—an administered economy in the hands of the regime and of the Revolutionary Guard. In the best of worlds, the struggle of Iran's reformers would have still been a difficult undertaking. 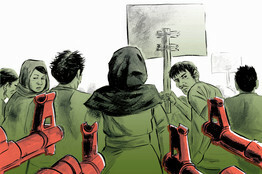 But Iran's oppositionists labored against the background of a bleak international landscape. Democratic struggles never occur in isolation. Freedom House tells us that there is a "freedom recession" in today's order of nations. The world-wide economic crisis of 2008 has been a boon to authoritarianism, for pessimism and economic anxiety are the autocrats' allies. Two of the great powers, China and Russia, are openly contemptuous of democratic norms, and China holds before others the success of its model—political autocracy and a crony-run economy. The autocrats in Beijing and Moscow favor Iran's rulers and partake of a worldview congenial to the regime in Tehran. Neither power cares about the conduct of Iran's rulers at home—so wedded are both Russia and China to the principle of unfettered national sovereignty. Neither power would countenance tough, punishing sanctions on the Iranian regime. The Russians and the Chinese may have gone through the motions of imposing a fourth round of sanctions on Iran, but they did so secure in the knowledge that the Iranians will find a way around these sanctions as they have in the past. In Iran's larger neighborhood, the despotisms are in the saddle, and the masters of the Iranian regime can point to their alliance with Syria and Hezbollah and Hamas as evidence of their skill, of the drive that made Iran, for all practical purposes, a power of the Mediterranean. There was once a time, not so long ago, that Turkey's example of a successful, decent democracy could be held up as a rebuke to Iran. But that is no longer the case, as Turkey courts Iran and turns its back on its old American alliance. A regime that can tell its people that it is on the verge of becoming a nuclear power is not one to apologize for the show trials of dissidents or for the reformers hauled off to prison. Meanwhile, America's new standard-bearer, President Barack Obama, had come to a conviction that the pursuit of freedom in distant lands was not a legitimate American concern. From his first days in office, Mr. Obama signaled his resignation toward the despotisms of the Greater Middle East: He would take them as they come. For the Iranian regime in particular, Mr. Obama held out the promise of "engagement." This was to be his diplomatic showcase, the purest embodiment of his break with his predecessor's legacy. Full of hubris about the appeal of his own biography to Muslims, Mr. Obama was certain that his diplomacy would work where George W. Bush's hard line toward the theocracy had failed. Then came last June's election and an outpouring by the Iranian people for representative democracy. The Obama diplomacy was caught flatfooted by the tumult, to say the least. Mr. Obama had bet on Iran's rulers, but a democratic opposition—in our image, speaking the language of democracy and unfurling its banners—was in the streets contesting the rulers' will and the rulers' truth. It was a moment of supreme embarrassment for the United States—a case of both strategic and moral failure on the part of the president. There is no guarantee that categorical American support would have altered the outcome of the struggle between autocracy and liberty in Iran. But it shall now be part of the narrative of liberty that when Persia rose in the summer of 2009 the steward of American power ducked for cover, and that a president who prided himself on his eloquence couldn't even find the words to tell the forces of liberty that he understood the wellsprings of their revolt.